Summary: This is one of the nicest Chromebooks available out there. 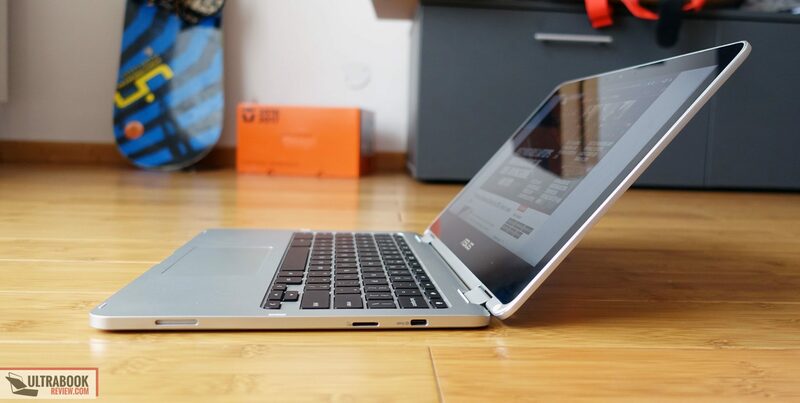 It's more expensive than most, but the premium is justified by the superior build quality, the IPS touchscreen, the 2-in-1 form-factor, the backlit keyboard and especially the smooth everyday experience facilitated by the fast and fanless Intel Core M hardware platform inside. The C302CA is not without glitches, but as long as you don't run into QC issues, you'll probably live with them just fine. Read on for the whole story. This article is a few months late, but hey, better late than never. 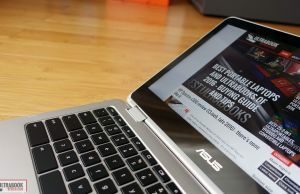 It’s about the Asus Chromebook C302CA, one of the best Chromebooks available in stores in 2017. 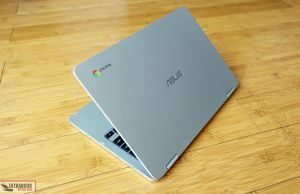 Unlike most Chromebooks, this one is more expensive, selling for between $470 to $650 depending on the configuration you choose. And that’s because it’s nicer built than most Chromebooks, it gets a touchscreen, a 2-in-1 form-factor and pretty capable Intel Core Y hardware inside, which corroborated with the overall speed of the ChromeOS environment, allows this to outperform Windows computers in the same price range. 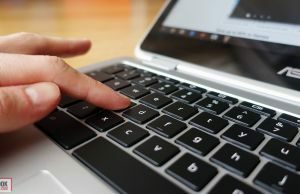 If you don’t know what a Chromebook is and how it differs from a regular notebook, you should go through this article. 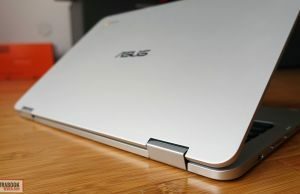 In very few words though, a Chromebook is an excellent option for activities that are somehow connected to the Internet: browsing, streaming movies and music, editing documents in the Cloud, even playing online games. 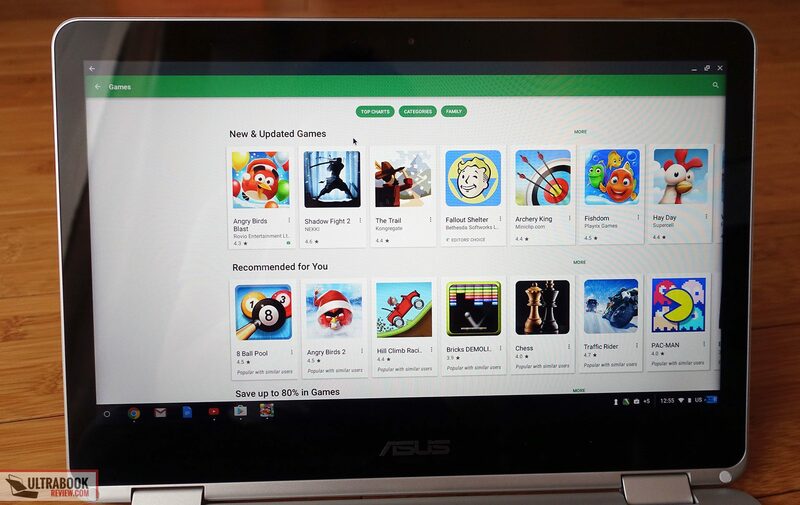 It’s built on ChromeOS, an operating system based on Google’s Chrome browser and Google’s services (Gmail, Youtube, Drive, Music, Movies), and it gets access to most apps available in the Google PlayStore, apps you’re familiar with if you’re using on a Android phone or tablet. It can be used offline as well, but is crippled in this case. 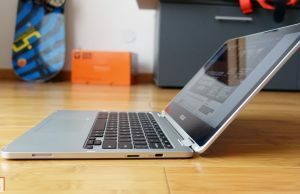 Anyway, I’ve used the Chromebook C302CA for a few weeks and gathered my impressions below, with the strong points and those aspects that could be improved. 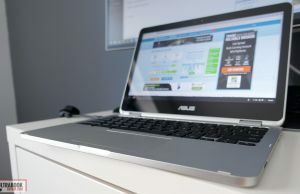 Read on to find out if this is a good buy and why it’s probably worth paying the premium over a regular Chromebook. 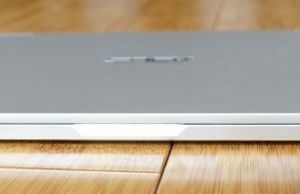 I bought one of the first Chromebooks, the Acer Chromebook 720, and I have to say things have a come a long way since then, as the C302CA is a completely different experience. For starters, it is one of the better built laptops I’ve ever got my hands on and it puzzles me why many of the Asus Windows laptops are not as nicely crafted. There’s no give or bulge in the lid or in the interior, there’s no squeaking when grabbing it firmly in hand, nothing. On the other hand this computer is a bit large and heavy for a 12.5-incher in 2017, but I still find it portable and light enough (2.65 lbs) to carry around, and I for one would gladly live with a few extra fractions of a .lbs and even a few extra mms in length and width when the end product is as well made as this one. 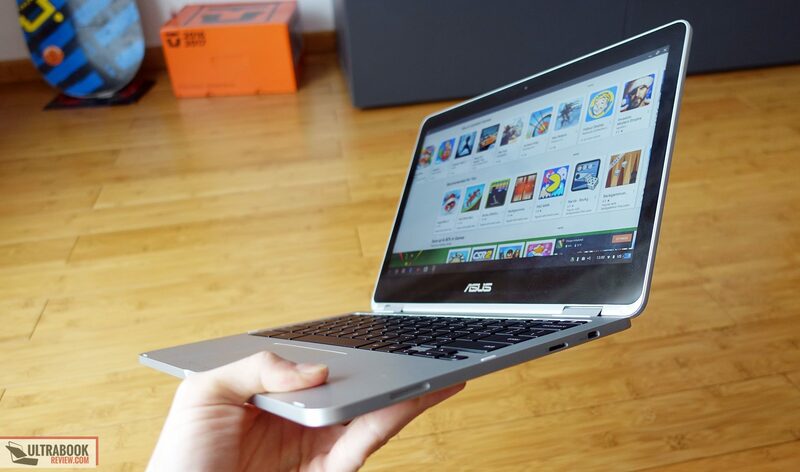 Build aside, the Chromebook C302 gets a boxy shape with straight corners, much like the Chromebook Pixel or the Apple Macbook Pros. I for one like it, but it might not be for everyone. My only nit is with the rather sharp inner lip, but the laptop has a low profile and that means my wrists don’t actually got in touch with it. For materials, the lid and underside are metallic, with a simple smooth finishing, while the interior and sides are made out of a silver plastic, with a slightly rougher texture. Both feel nice, hide fingerprints well and I’d expect will age fairly well too. Some of you might be put away by the plastic interior, considering other cheaper Chromebooks actually offer complete aluminum shells. I see your point, but I feel the premium Asus charges for this device is justified by some of the other aspects and I can make due with the plastic interior, especially since it’s not the crappy kind. As far as aesthetics go, there’s nothing flashy about this laptop and all the parts blend well together. The exterior, hinges, sides and interior are all the same shade of silver. 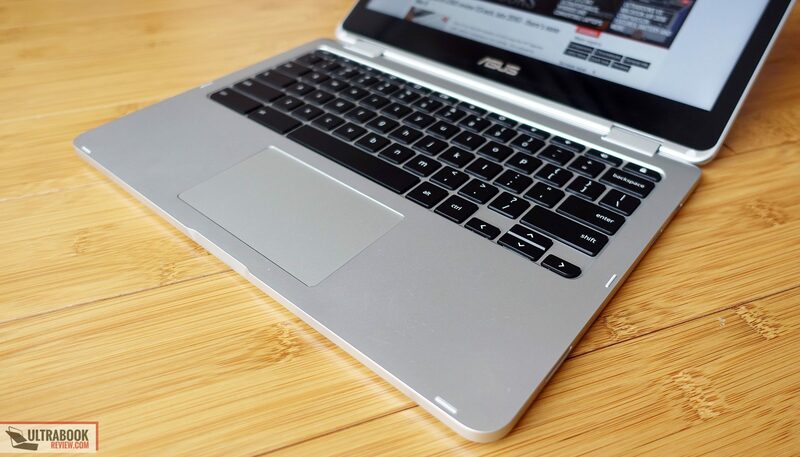 Even the Asus logo on the lid blends in, with the colored Chrome logo and darker Chrome branding being the only splash of something else. But let’s see how this laptop feels in everyday use. We already established it’s well made and you’ll feel perfectly safe to grab it along and throw it in your backpack. 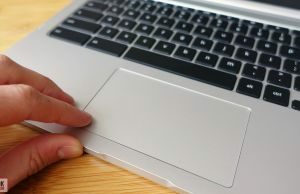 Its screen is easy to lift up, there’s a crease on the front lip for your fingers to grab it from, but you’ll probably need both hands to completely open it up, as the hinge stiffens past 45 degrees and lifts up the main-body as well. 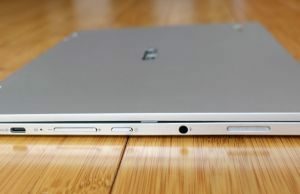 Despite that, the hinges are rather weak in normal laptop mode and the screen wobbles a bit when poked and doesn’t’ stay in place when moving the laptop. 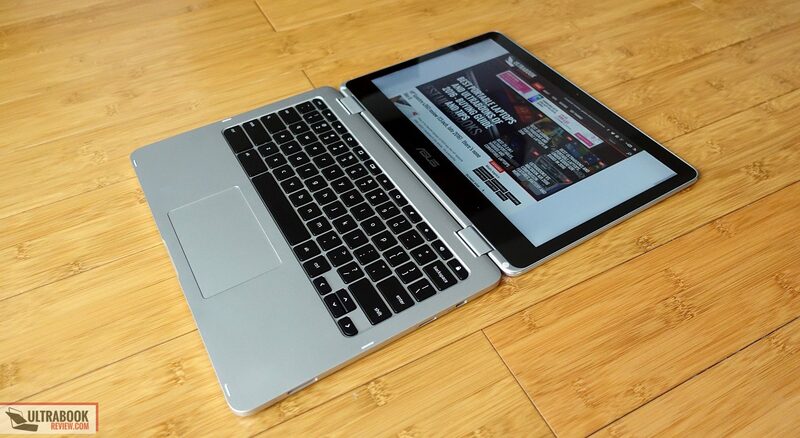 You should not forget that the Chromebook C302 is a 2-in-1, so the screen flips all the way back to 360 degrees. Magnets keep the screen attached to the main body both when it’s closed and in Tablet mode, and overall I feel this is one of the nicest hybrids to use as a Tablet. 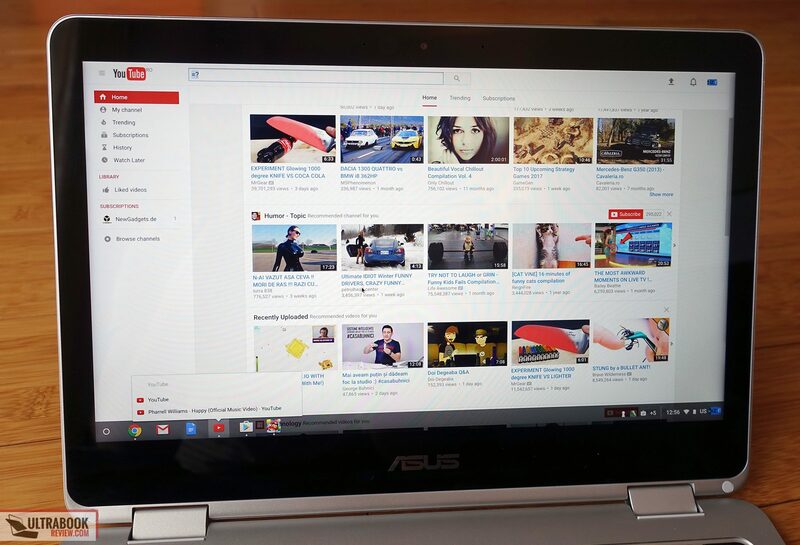 First of all, Chrome OS is very responsive and everything happens very fast when you touch the screen or rotate it, faster than on a Windows laptop. And second, although the bezels are rather ugly, they offer plenty of space to grab this from. 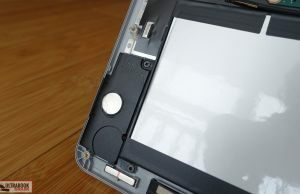 Third there’s the study build that enhances the tablet experience too, as there’s no flex when holding the device, and fourth, the fanless hardware inside means there are no air exhaust grills in your way. Of course, holding it in hand for a longer time is not very comfortable, this still weighs 2.65 lbs, but for couch use or watching a movie in Tent mode, the C302CA will do very well. 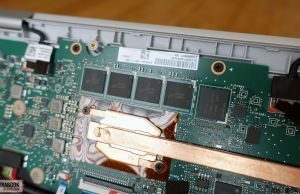 I’m not that happy with the IO though, i think there’s enough room on the sides for this computer to accommodate some full-size ports, but instead Asus went with miniaturized connectors. You’ll find two USB Type-C gen1 ports on each side, a microSD card-reader, the headphone/mic jack and the power button and volume rocker. Of course, there are adapters and docks out there, and there’s also the argument that you’re not going to use the ports that much on a Chromebook anyway, but hey, I for one would have liked at least an USB-A and a full-size HDMI port on this thing. 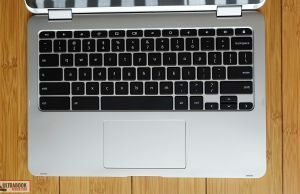 The keyboard is pretty standard for a Chromebook, with a nice layout and large and well spaced keys. 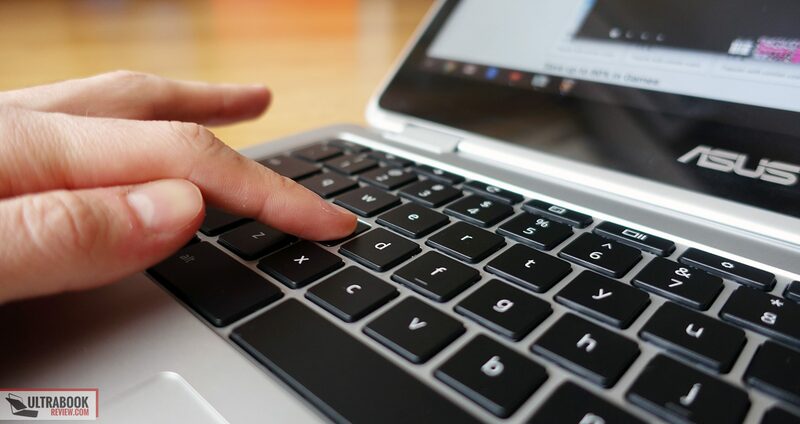 You’ll notice that there are no Function keys at the top, which are instead replaced by various quick-action keys, and there’s of course no Windows key either, so if you’re using keyboard shortcuts you’ll need some time to get used to the fact they’re not the same on a Chromebook. 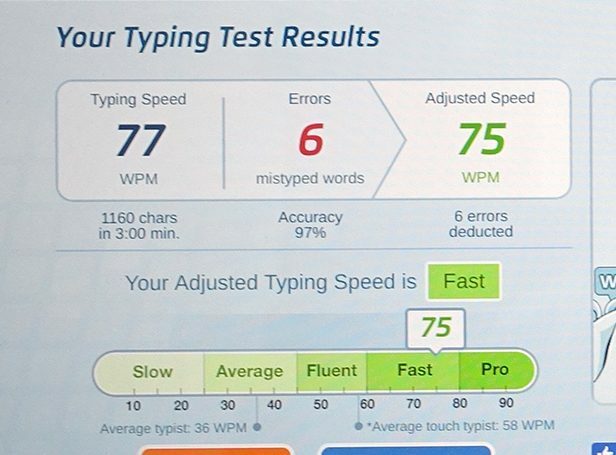 As far as the typing experience goes, this keyboard is very fast, one of the fastest out there. 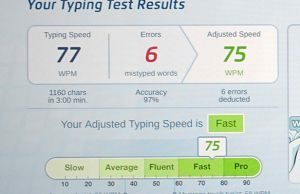 It took me a while to get used to the feedback though, as the keys are too soft for my liking and actuate very quickly, which means they can register by mistake even when very gently stroked. That’s the opposite to what happens with most keyboards you’ll find on portable laptops these days, which are fairly shallow and actually have to be pressed firmly and precisely in order to actuate. Once you get a hang of the feedback, I’d expect you’ll probably enjoy typing on this thing. It’s a little chattery, as the stroke is fairly deep as well, so it might not be ideal for typing in a very quiet place, like a library. One other aspect I’ll have to add is that the keys are also backlit, something most other Chromebooks don’t offer. 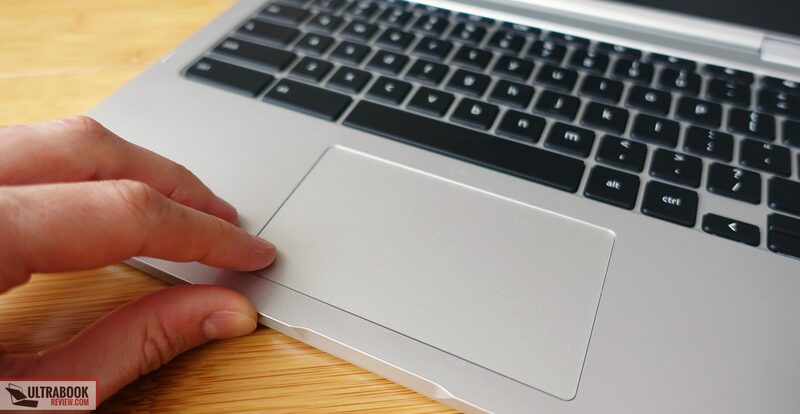 As far as the clickpad goes, it’s large and made out of plastic, so the fingers don’t glide that easily on it as on some of the glass surfaces out there. 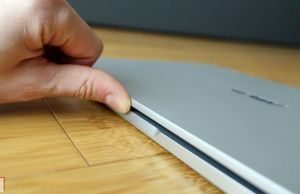 It performs well overall though, even with light taps, precise swipes or when having one finger on the surface and swiping around with another. The physical clicks are pretty nice too, not stiff, nor noisy. I had some issues with gestures though. Two-finger scrolling and navigating between tabs with three-fingers work fine, but two-finger zooming was disabled on my unit out of the box and I couldn’t get two-finger back and forward to work in the browser. Perhaps there’s something I’m missing, but the customization options are very limited. I’ll have to add that some people complain online about a jerky trackpad on their units, but mine was far from it, so that means there might be some quality control issues you have to be aware of. Just make sure to buy from a place that allows easy returns and properly check your unit’s trackpad, just to make sure you did not draw a short stick. 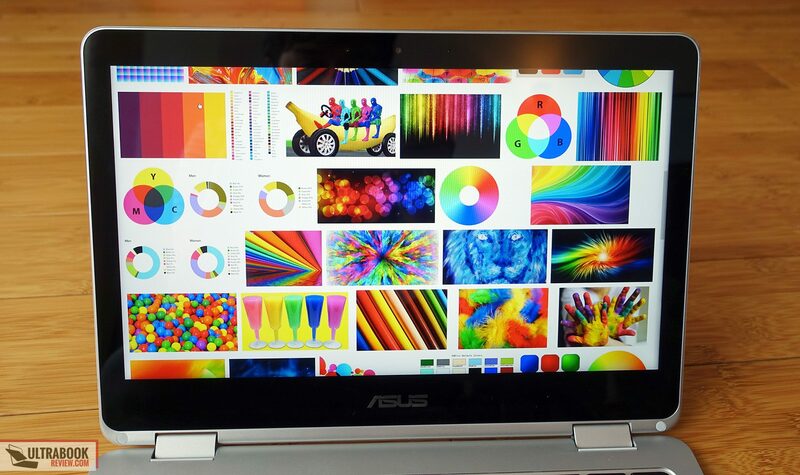 The Chromebook C302CA gets a 12.5″ inch 16:9 touchscreen with 1920 x 1080 px resolution. 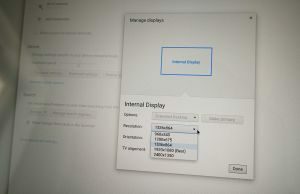 It comes scaled down by default to 1536 x 864 pixels and you can easily change that from the settings, but I’d recommend you keep it that way, everything looks tiny on the native 1080p resolution on such a small display. The FHD panel is a very good match for the hardware inside this computer. 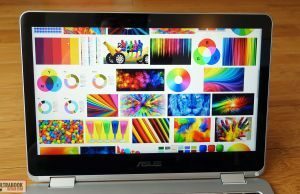 Lower resolution screens would look bad on what’s a premium Chromebook, while higher resolution screens (like on the Chromebook Pixel and Samsung 2-in-1 Chromebook Plus) take a toll on performance and battery life, as they have more pixels to render, without an easily noticeable increase in sharpness. 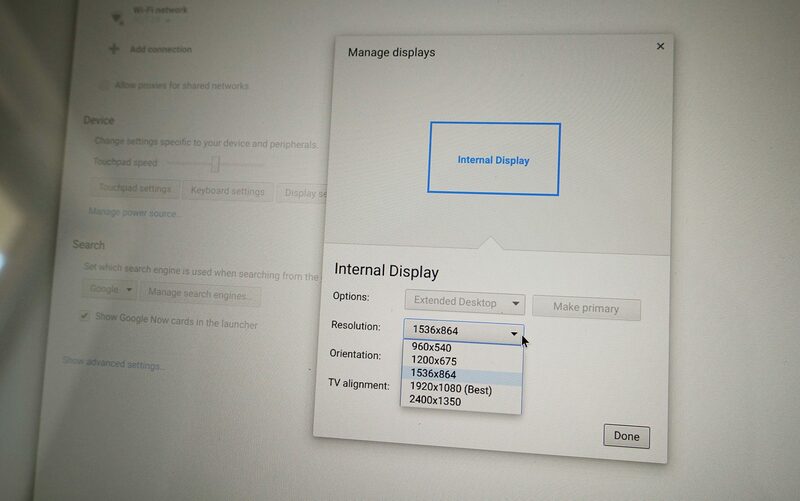 Some of you might not appreciate the 16:9 screen’s aspect ratio, given how there are a few other Chromebooks with 3:2 screens. Coming from Windows devices, I’m alright with 16:9 and I believe it’s a good option for everyday use and movies. You should be aware that some of the third-party apps in the store might not look perfect though, especially in Portrait Tablet mode, but then again, not all of them are optimized for 3:2 screens either. There are also the bezels around the screen that might steer you away. I agree they’re a bit hefty for this day and age, but I could live with them just fine, so it’s up to you if that’s an issue or not. They’re about the same size on the Acer Chromebook R13, but narrower on the Samsung 2-in-1 Chromebook Plus. Touch on the other hand is responsive and works very well. Whether it’s a must on a Chromebook or not, well, that’s again up to you. There’s no digitizer or Active pen support though, so while you can use a basic stylus to draw on the screen, the experience is very limited, as there’s no pressure support and no proper palm-rejection either. 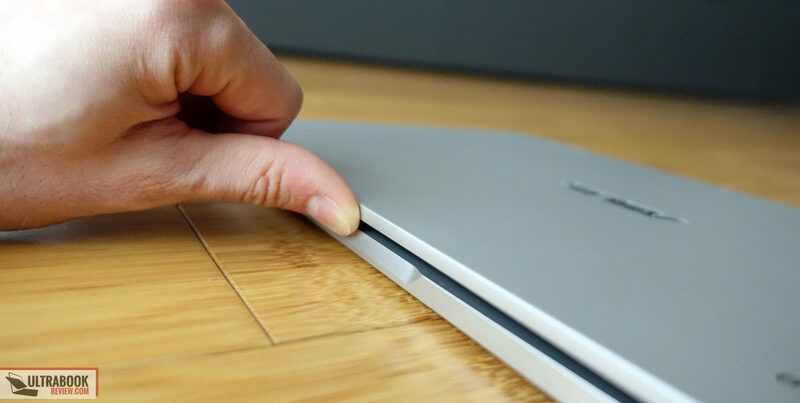 If this aspect matters to you, the Samsung Chromebook is a much better option. As far as the panel goes, my Spyder4 doesn’t work on Chrome so I can’t get you any technical data. It’s an IPS panel with pretty good viewing angles, average colors (warm tint and reds are rather orange; I don’t know if they can be adjusted – my calibrator doesn’t work on ChromeOS) and a maximum brightness of up to 300 nits. That means it’s a good choice for everyday use, but not the best option for bright environments or outdoor use, where the glossy layer of glass on top of the panel and average brightness show their limits. There’s an auto-brightness sensor included, but it will be disabled if you adjust the brightness manually and only a reboot will reset its behavior. Not an issue for me, as I prefer adjusting the brightness by myself, but something you might want to know. 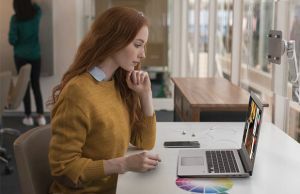 The C302CA is more powerful than the average Chromebook, as it’s built on Intel Skylake Core M hardware, with core m3, m5 and m7 processors, 4 or 8 GB of RAM and 64 GB of storage. There’s no KabyLake update and only the core m7 configurations get 8 GB of RAM in most regions. We got to test the Core m3-6y30 model with 4 GB of RAM and it proved to be surprisingly fast. My experience with Chromebooks is fairly limited. 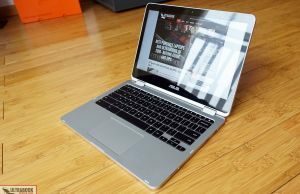 I do own one of the first Chromebooks ever made (the Acer C720) and I did review a few Chromebooks in the past (like the Asus C200), but things have changed in these few years that I haven’t touched one. Regardless, you should make sure to read other opinions as well from people who’ve followed Chromebooks more thoroughly. Anyway, I was impressed by how fast and snappy this C302CA is. It resumes from sleep almost instantaneously, it loads the browser fast and it multitasks between 10-15 tabs well, with not sluggishness or stuttering. 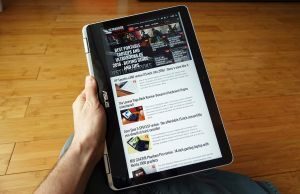 The screen rotates quickly in Tablet mode and the experience of watching a movie on Youtube is very smooth, close to what I get on my iPad and much smoother than on a Windows laptop. In fact, as long as you keep multitasking at bay, this laptop works nicer than a mind-range Windows laptop that costs a lot more. Coming from Windows devices, I was worried those 4 GB of RAM would take a toll on performance. Well, that’s not the case, or at least not with everyday browsing, content streaming and text editing in the Cloud. That’s important, as nor the memory or the storage are upgradeable on this computer. 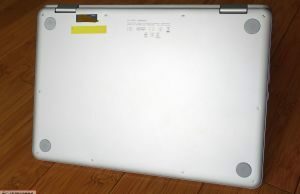 You can get inside if you want to, by removing the back panel that’s hold in place by a handful of Torx T5 screws, but that would only allow you to change the Wi-Fi module if needed, and get you access to the battery. 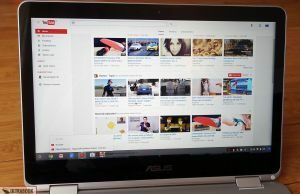 Of course, there’s only so much you can do in terms of multitasking on ChromeOS, and there are a lot of videos on Youtube explaining the differences and particularities of this OS. 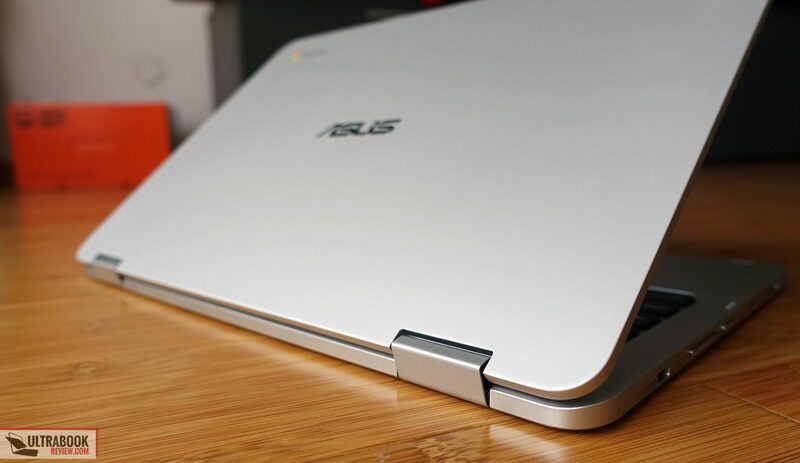 There’s also this article that explains what a Chromebook is and what you can expect from it. There is however the option to put Linux on this thing, for the geekier users among you. You’ll find details about that, and much more about aspects related to ChromeOS, in the dedicated section on Reddit. 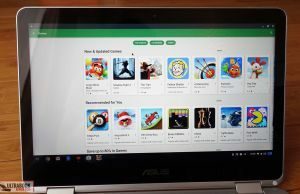 As of more recently, the Chromebook C302 gets access to Android apps in the Play Store. There’s a video about this below. While I’m posting this article in September 2017, it’s actually based on my experience with the Chromebook C302 in March-April 2017. It’s stupid, but I completely forgot about publishing the post and only got back to it now. Anyway, at that time enabling the Beta Channel to get access to the PlayStore came with glitches and numerous crashes.. 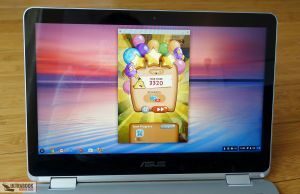 Besides that, the Android apps didn’t run as smoothly as I would have expected based on the experience with a phone or tablet, and many of the ones I tried were only working in Window mode. Things might have changed in the meantime, but I can’t share any more on the topic, so make sure to research further online. The experience was a lot smoother on the Stable Channel of ChromeOS, as mentioned already above. At that time the Stable version came without PlayStore access though, but for me it wasn’t a very big issue, as I don’t play games and could get things done with the browser apps just fine. WebXPRT 2015 – 274 pts. The average Pentium Chromebook scores around 12000 points o Octane, so this is a much faster option. 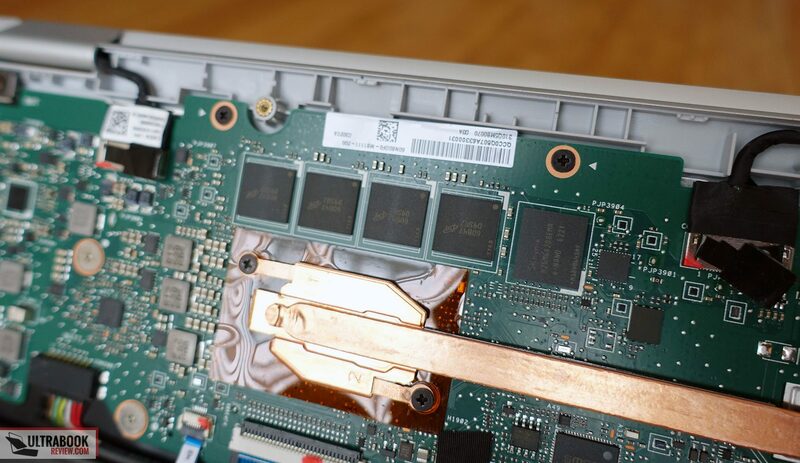 There’s no fan inside the Chromebook C302, as it’s built on Intel Core M hardware. That means it runs quiet, but my sample wasn’t completely silent, as I could notice some slight electrical noise, audible even at head level in a perfectly quiet room. The creaking got louder with more intense multitasking and benchmarks, and quieter with casual loads. Buyers also report coil whining on their units in forums threads, on Reddit and in the user reviews posted online, but it doesn’t seem to be a widespread issue. That means the electrical noise is another QC issue you might run into, which is one more reason you should get this from a place that allows easy returns in case you end up with a faulty unit. As far as temperatures go, this computer only gets warm with heavier multitasking, with certain spots on the back reaching high 30s. It keeps much cooler with casual use though, as you can see below. 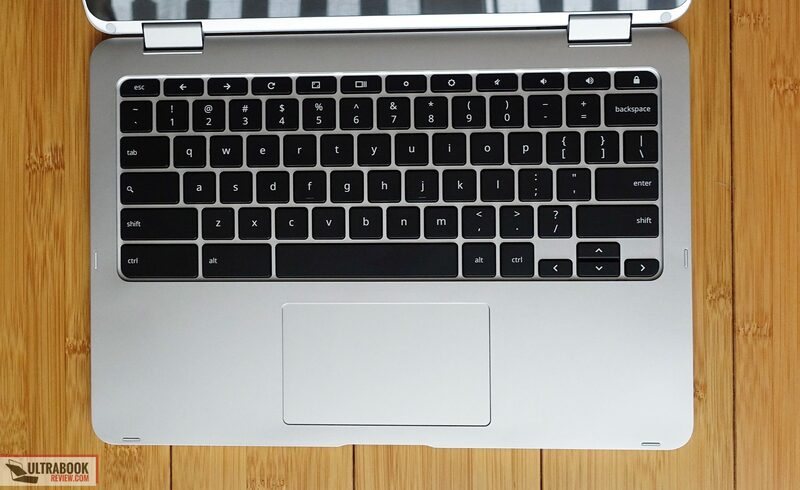 The Chromebook C302Ca gets Wireless AC and Bluetooth from an Intel 7265 chip. It’s a pretty good performer both near the router and at medium ranges, and I didn’t notice any drops, disconnects or other issues. Some people online complain about Bluetooth disconnects though. I didn’t try any Bluetooth device with this sample, so I can’t comment on the subject. The audio is handled by two small speakers firing trough some minuscule cuts on the sides. They’re not bad, but not great either, with a maximum volume of around 78 dB at head-level and average sound-quality, with decent mids and very little base. Overall, I’d say these are not bad for a $500 laptop, but from what I’m reading you can get better speakers on some of the other Chromebooks. 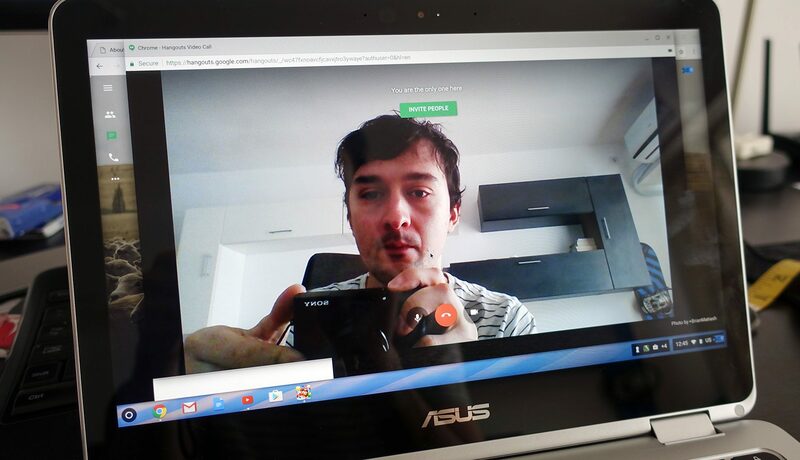 Last but not least I’ll mention the webcam, with HD resolution and placed on top of the screen. It’s rather grainy, but it should do fine for occasional Hangouts. 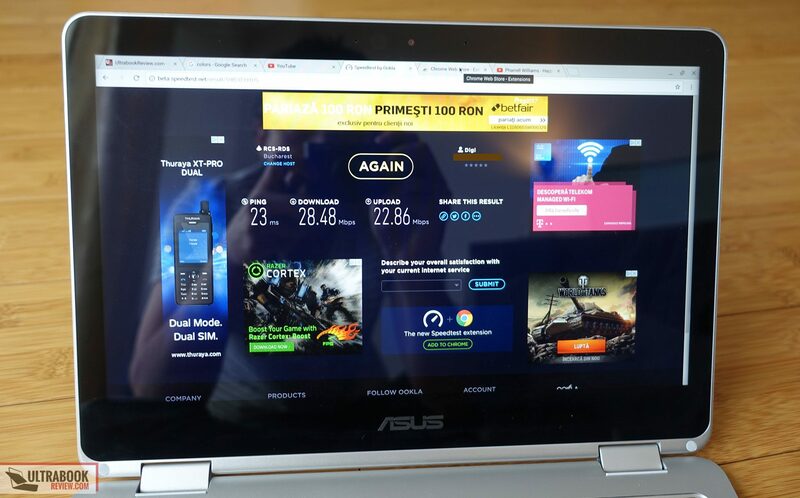 This laptop gets a 39 Wh battery and Asus claims it can run up for to 10 hours on a single charge. I didn’t run detailed tests on this sample and I can’t offer you the estimations that I usually offer in my reviews, as HWInfo doesn’t work on ChromeOS. What I can however tell you is that I got around 5-6 hours of daily use that involved everyday multitasking with some browsing, some Youtube, Facebook, etc. I also got around 7-8 hours of Youtube 1080p streaming, both indoors with the screen set at around 30% brightness. The C302CA gets a compact 45W charger and it charges via USB-C though any of the ports on the sides. A full charges takes around 2 hours. 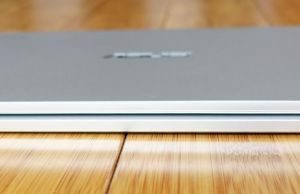 The Chromebook C302 is available in the US for around $470 in the configuration tested here, with the Core m3 processor, 4 GB of RAM and 64 GB of storage. 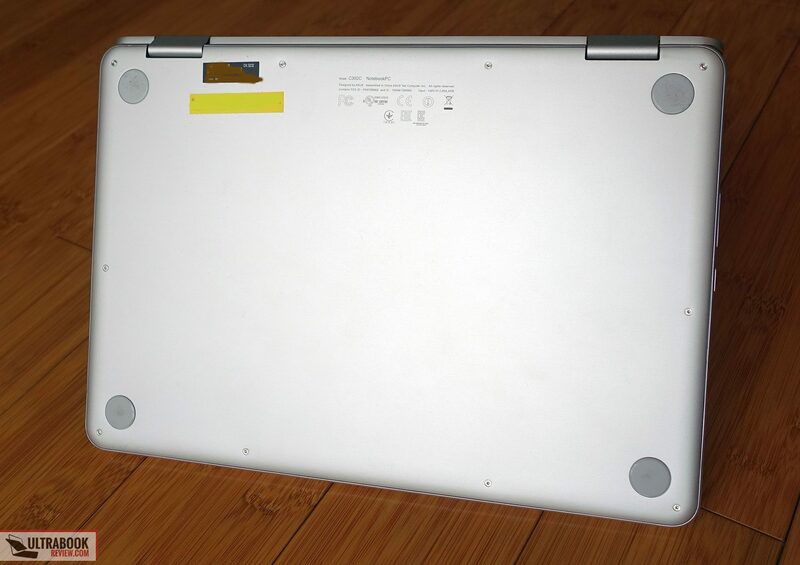 A Core m5 model is also available for around $200 extra, but the base model offers much better value for the money. 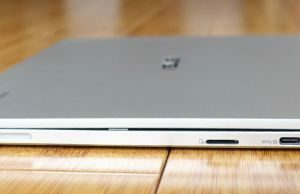 The Core m7 configuration with 8 GB of RAM and 64 GB of storage is also available in some regions (the UK, for instance), but is way too expensive to consider if you ask me. Follow this link for up-to-date prices at the time you’re reading the post, as well as users reviews from those who already bought it and left their feedback online. The C302CA is rather pricey for a Chromebook, given you can find smaller models that can basically do the same things for under $200 these days. You’re paying extra for the convertible form-factor, for the build, for the IPS screen and for the hardware inside that ensures a nicer experience, even on the base model with the Core m3 processor and 4 GB of RAM. 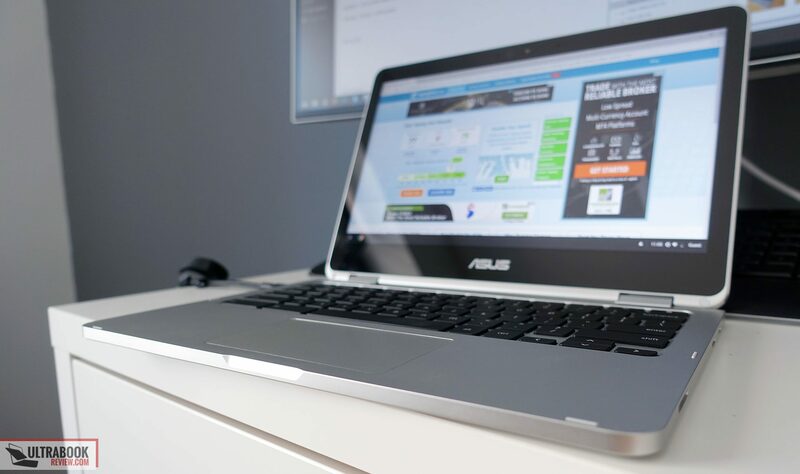 These are worth the premium, and a lot of people paid it and ended up happy with their buy, judging by the multitude of positive reviews this Chromebook gets on websites like Amazon, B&H or in the Google Store. Quality-control can be an issue though, as mentioned throughout the article. Some people reported problems with the screen, with the touchpad, with coil whining, with Bluetooth or even abnormally short battery life. As long as you buy from a reputable store that allows easy returns and accept that there’s a possibility you might draw a short stick, you should be alright, even if that could involve a return or two. Still, the Chromebook C302CA was released at the beginning of 2017 and at that time, there was no other Chromebook like it. 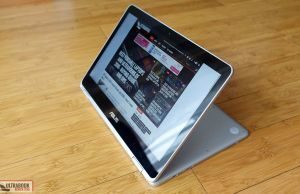 As of September 2017 though, there are at least two similar 2-in-1 Chromebooks you can consider as alternatives, the Acer Chromebook R13 and the Samsung Chromebook Plus 2-in-1. The Acer R13 sells for about $100 less and gets a bigger 55 Wh battery, but it’s also larger, heavier and built on a slower CPU with only 32 GB of on-board storage. If you’re not a on a very tight budget and if you don’t value battery life over most other aspects, I’d rather go with the Asus and Samsung alternatives instead. 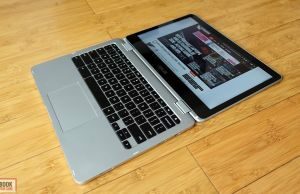 The Samsung Chromebook is a much closer match-up. 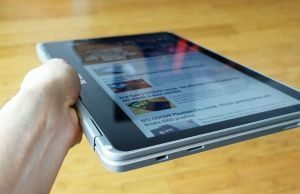 It’s smaller and lighter (2.4 lbs), but its main selling point is the 3:2 screen with a higher resolution and support for the included stylus, that makes it a superior tablet. The Samsung model sells for around $450, so it’s on par with the Asus option. It also gets a similarly sized 39 Wh battery, yet the Asus outlasts it due to its more efficient display. The Samsung Chromebook Plus is however built on slower hardware and only gets 32 GB of storage, yet most people claim it’s still fast enough for their needs, as you can see in this analysis. 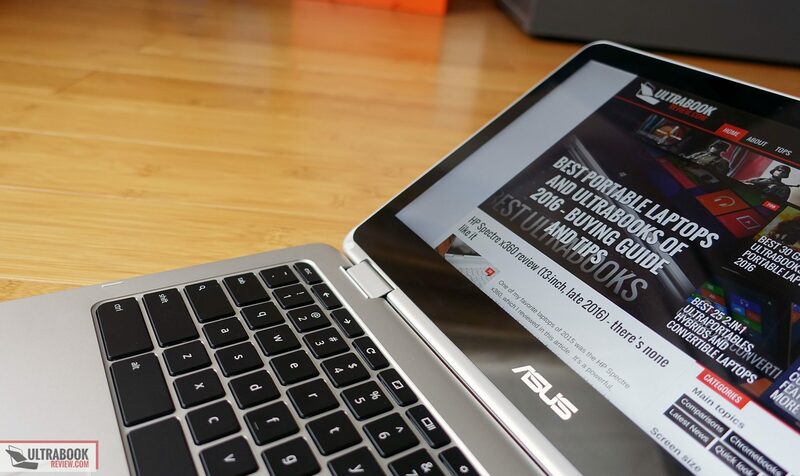 At the end of the day though, the Asus Chromebook C302CA is even in the second half of 2017 one of the best all-round Chromebooks available out there. 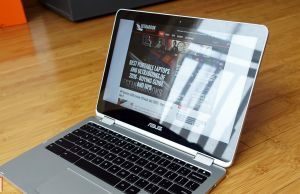 It has gotten a price cut since launch, but is still expensive for a Chromebook, yet it’s also much nicer than most of the other options that sell for less, and as long as your use involves mostly browser based activities, a very good and affordable alternative to the cheap Windows laptops out there as well. 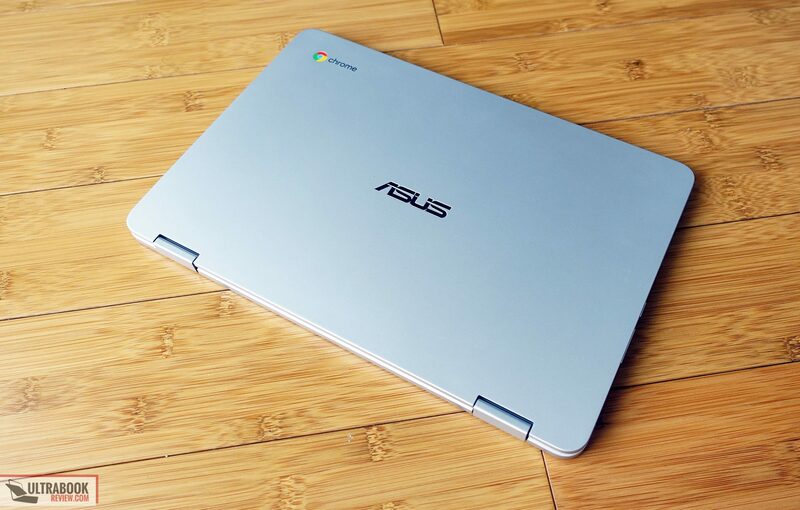 Follow this link for a list of the best Chromebook available these days, and this one for a list of affordable Windows models you can consider instead. 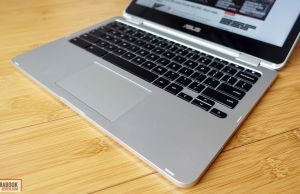 That pretty much wraps-up this article about the Asus Chromebook C302CA. 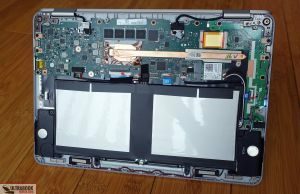 I’m sorry it’s so late, but hopefully you’ll still find it useful, even if it’s not as detailed as my other reviews of Windows based computers. Don’t forget the comments section below is open for feedback and questions, so don’t hesitate to get in touch.